Home > Blog > What are Drain and Plumbing Vents? According to a dictionary definition, a vent pipe is a pipe above a waste pipe or soil pipe that allows gas to escape from the system. The plumbing vent, also known as a vent stack is responsible for regulating the air pressure in your plumbing system. Just as drain pipes remove water and waste from your home, the plumbing vent pipe removes sewer gas and odors. Fresh air gets into the plumbing system via the plumbing vent and this allows water run smoothly through the drain pipes. But no water runs through the plumbing vent pipe. 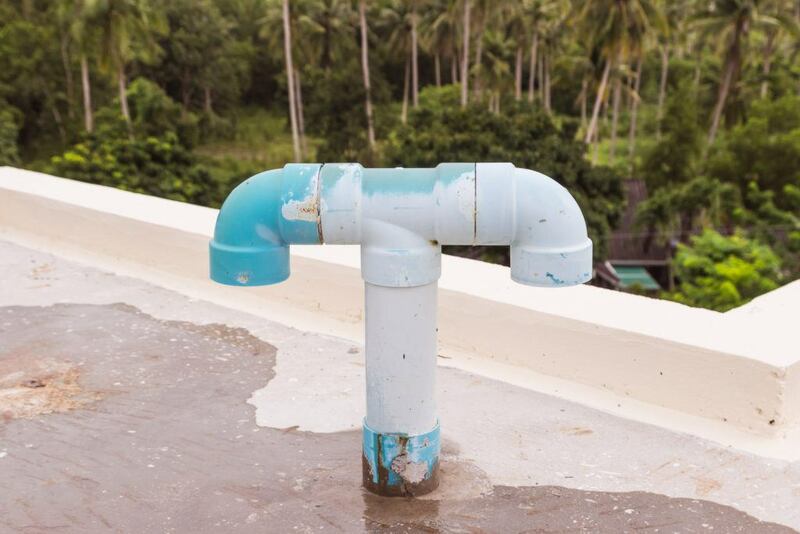 It is actually a vertical pipe that is connected to a drain line and flows through the roof of your home. The vent stack is the pipe that leads to the main roof vent. Have you ever noticed those PVC pipes on the roof of your home? Those are your plumbing vents. There is a certain purpose for their installation. They channel the exhaust gases to the main roof vent and facilitate in maintaining proper atmospheric pressure in the waste system. Plumbing vent pipes are usually located on the roofs, away from windows or air conditioning units to let fumes easily dissipate. Drain vents play a major role in a home’s drainage system. Venting allows water to pass out of the drains fast and without any complications. The vent stack is connected to your drainage system to help wastewater move easily through your drainage lines. Watch out for the following signs indicating that your vent stack is clogged or requires some maintenance. If you noticed that characteristic rotten egg smell around your home, there are certain reasons for that. If it’s not old trash, spoiled food or the dog, most likely it is the smell of a clogged plumbing vent. In this case sewer waste collects in your pipes and settles there, producing hydrogen sulfide over time and back flowing into your pipes and home. Hydrogen sulfide is pretty harmful when it collects inside a closed structure. This gas smells like no other and you don’t need a special detector to sense it. As soon as you smell a rotten egg odor at your home, and there’s no other reason for it, suspect hydrogen sulfide. Open all windows to let fresh air in and contact a plumber immediately. The cause of the gas buildup may be a vent-stack blockage, but it may also be a faulty vent installation, a plumbing fixture that was out of use or a broken pipe. Some critters like frogs, rodents and even snakes can end up in your toilet bowl. This is both disgusting and troublesome. How in the world any animal could endure the trip up through the curve of the toilet drain?! How could it enter the drain system? Your roof vent stack could easily become an “entryway” to your plumbing system. To avoid unwanted guests in your toilet or roof vent, have professional plumbers install durable mesh coverings over the vent opening. Inspect the covered vents (if there are more than one) regularly to make sure the cover over each vent is undamaged and securely fastened to the pipe opening. When you hear gurgling sounds as the plumbing fixtures drain, it’s usually the result of a vacuum being formed in your plumbing system. Improper venting of a fixture or some other part of your plumbing system indicates the vacuum inside of it. The venting built into your plumbing system helps to circulate air and water through the pipes. If any part of the drainage or venting system is obstructed, gurgling sound implies that negative pressure is making water push through trapped air in the drainage or plumbing system. It could as well be the clog in your vent stack. A bird nest, various debris and leaves could be the cause for this clog. That’s why it is so important to cover your plumbing vents. Contact Downey Plumbing Heating & Air Conditioning to solve your problem with the plumbing vent. Our qualified plumbers will check out the vent stack and professionally clean it if necessary.